Know Melba Toast? Like Melba Toast ... then this ‘Toast’ is for you! Its ever so thin, light and crisp ... just like Melba Toast. 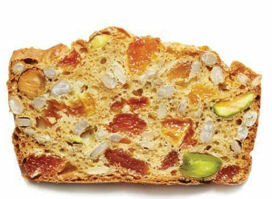 BUT what makes it unique is that around 60 % of the cracker is composed of fruits, nuts and seeds. Ideal with delicate Goats’ Milk Cheeses such as Valencay, Crottin de Chavignol & Ragstone. Sliced about 3mm thick, and solid with fruts and nuts, these toasts are the ideal partner to your Cheese, or just enjoy nibbling them as a healthy snack. Toast for Cheese .. ideal partner to Goats Cheese!